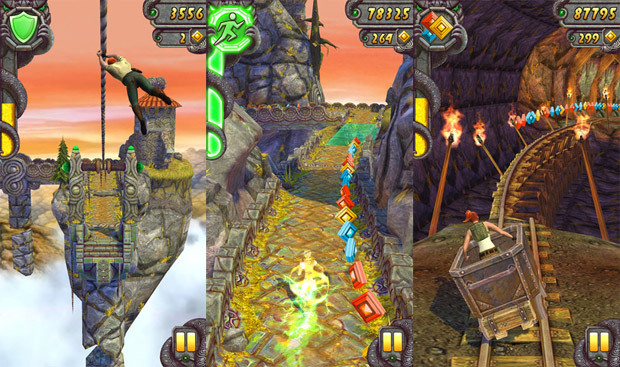 Temple Run 2 has garnered over 50 million downloads since its January 17 release on iOS, setting the record for "fastest growing mobile game," developer Imangi Studios today announced. The record was previously held by Angry Birds Space, released last April, which reached the 50 million mark in 35 days (and has a price tag of $1). Temple Run 2 earned over 6 million downloads in less than 24 hours on Apple's App Store alone, quickly rising to the top spot in the 'Free' category, and followed suit a week later when released on the Google Play Store and Amazon Marketplace. Whether or not it will top its older brother's number of 170 million total downloads remains to be seen, but it's off to a good start so far.